Autor Name: Happy Jack Inc. Skin Balm affords relief to certain common skin problems sometimes referred to as summer eczema, kennel itch, or hot spots (moist dermatitis). These conditions are characterized by intense itching and scratching, followed by rough scaly skin, and hair loss. 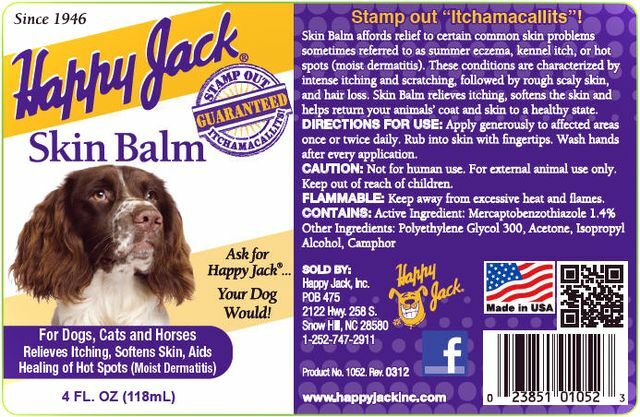 Skin Balm relieves itching, softens the skin and helps return your animals' coat and skin to a healthy state. Apply generously to affected areas once or twice daily. Rub into skin with fingertips. Wash hands after every application. Not for human use. For external animal use only. Keep out of reach of children. Keep away from excessive heat and flames.